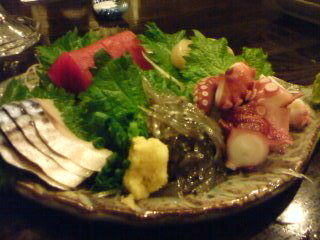 Kaze To Matsu is a great example of a successful Izakaya which shows that a chef’s origins do not matter when recognizing and serving an intelligent combination of produce from Shizuoka and other Prefectures. 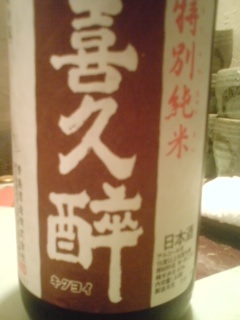 Mr. Matsumiya, for all his relative youth, shows a remarkable eclectism when choosing Shizuoka Sake to accompany brews from Gunma Prefecture, his home: Hakauin Masamune (Takashima Brewery, Numazu City), Isojiman (Yaizu City), Shidaizumi (Fujieda City) and Hana no Mai (Hamamatsu City). 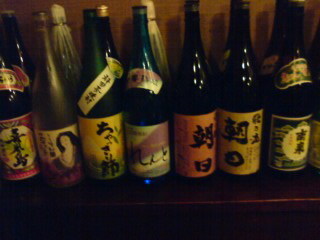 Naturally, all kinds of drinks, including wine, are available. The place, seating 11 at the counter and 14 at very comfortable tables, is very popular, and I would definitely recommend anyone to reserve especially on week-ends. My good friend Patrick and I made a point to come before opening hours to reserve two seats at the counter and we certainly well when the establishment was packed by 18:00! 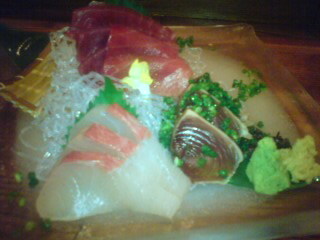 We are both fans of sushi and ordered the “Special Sashimi Plate”. 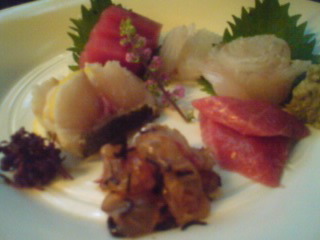 “Kanpachi”/Japanese Amberjack, “Tennen Maguro”/Wild Tuna, “Nama Yuba”/Tofu Sheets, “Suwagani”/Suwa Crab, “Kanpachi” again, “Tachiuo”/Scabbard Fish (under the shiso flowers) and “Koushin Daikon”/A red inside daikon variety. 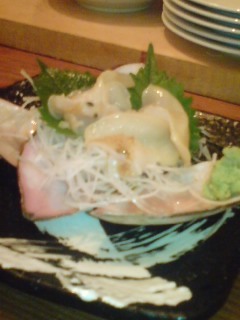 We spotted some fresh seashells on display. I had noticed them before, but I couldn’t remember their name. 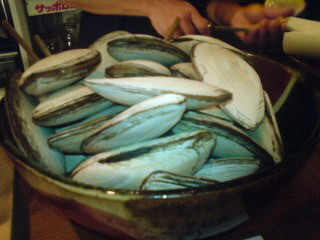 “Shirogai” is the usual name in Japan, meaning White Seashell. 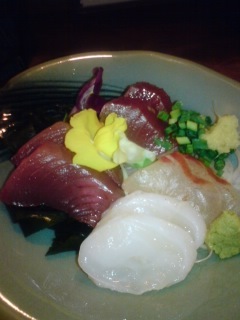 As they were still alive and appetizing, we opted for a plate of sashimi! Almost sweet they were, a discovery! 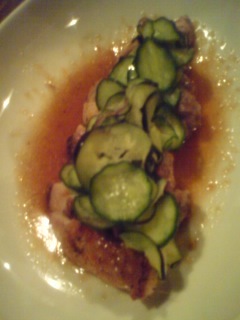 The menu is very extensive and we had to limit ourselves to favourites for our first visit! 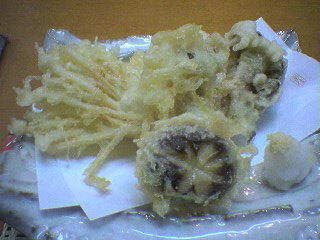 The tenpura (above pic) are served one at a time as they should be! 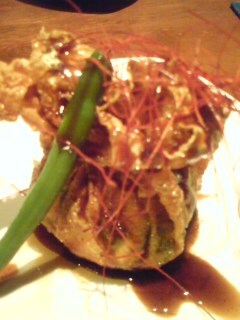 Succulent! 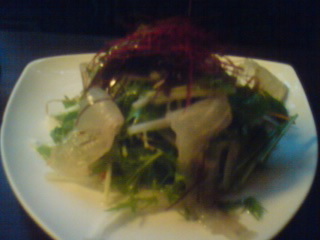 Vegetarians and vegans will rejoice to learn that Kaze To Matsu serve “Yuki Yasai Sarada”/Organic Vegetables Salad! 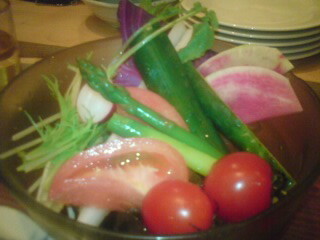 Very well-chosen seasonal vegetables only. 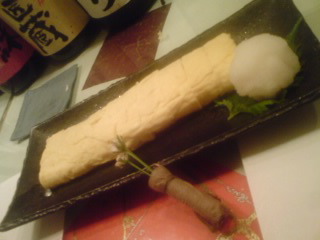 Whatever you have savoured, do end with their “Tamagoyaki”/Japanese Omelette! 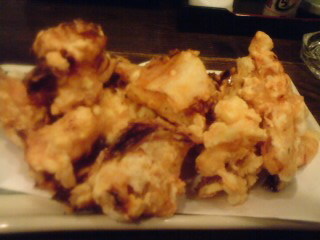 I can assure ou you won’t need any dessert! 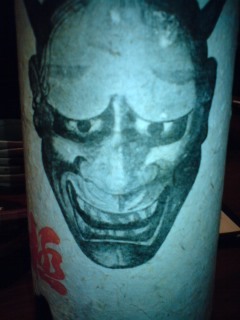 The Missus has this special liking for Bu-Ichi Izakaya (which I share! ), not only because she loves the food, drinks and atmsophere, bu also because she always to learn something new she will be glad to try reproduce (in her own way) back home! I’m not one to complain, and I certainly enjoy writing about the place over and over again! 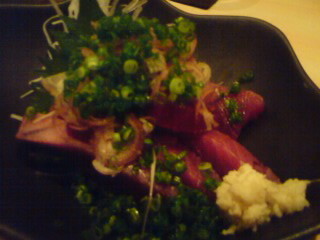 Onething is certain: this is one the very best places in the whole Prefecture to enjoy sashimi as once again demonstrated by the succulent katsuo/bonito served with grated ginger and thinly-chopped leeks. 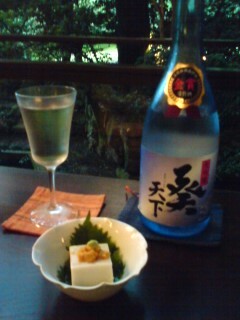 Another reason is the top-class Shizuoka Sake! 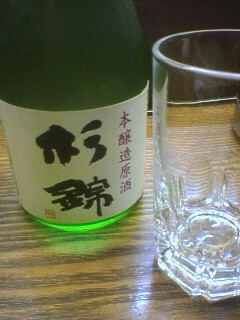 Hakuen Bishamon, Honjozo, a very soft, almost sweet sake (Dryness: +1, acidity: 1.3). 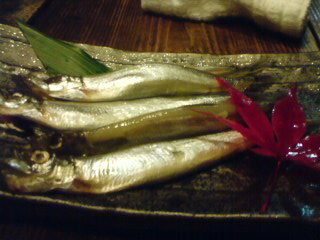 Sanma/Mackerel Pike is in season. 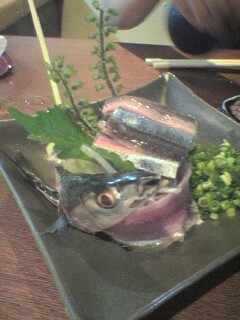 We ordered a yaki sanma sarada/grilled mackerel pike salad. 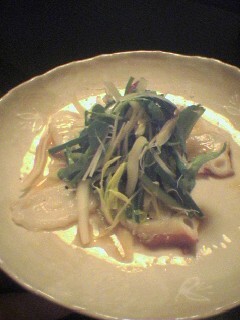 The fish is first grilled then shred into small bite-sized chunks and served with vegetables and home-made dressing. This is the recipe that the Missus has a special interest for! 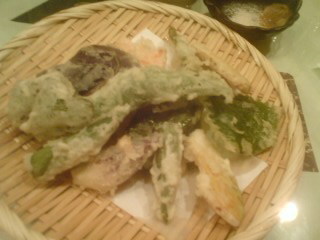 Talking of vegetables,Bu-Ichi, in spite of all its great fish and meat, would be the perfect place for a vegetarian too thanks to perfect vegetables tenpura! 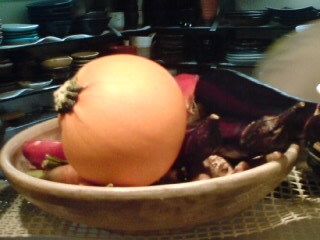 Wherever they come from, they are always exlusively seasonal! 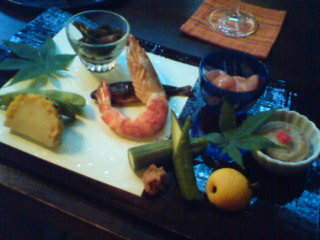 With such meals, sake tends to disappear too quickly! 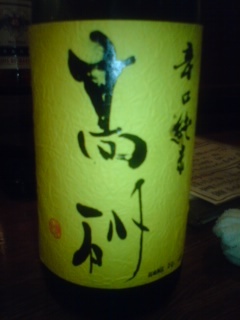 My next order was a Kikuyoi Tokubetsu Junmai by Aoshima Brewery in Fujieda City. 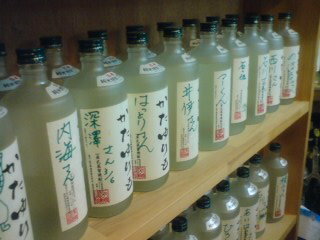 Mr. Aoshima makes superlative sake getting recognition all over Japan in spite of its relatively small size. 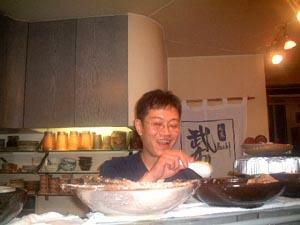 Incidentally he also speaks fluent English for those who would like to visit his brewery! 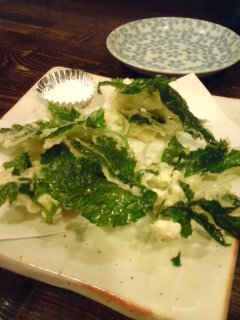 As we are both omnivores, we felt a little meat was in order to finish our meal (we usually skip dessert in Japanese restaurants as there is always the open possibility to visit another one later!). 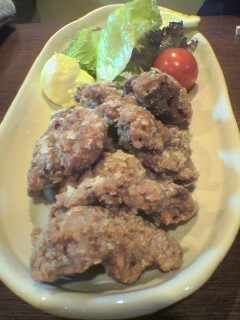 Bu-Ichi serves a scrumptious sansho tori karaage/fried chicken with Japanese pepper. 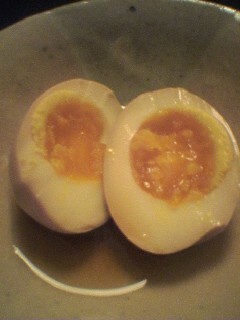 A beauty that my American friends in particular would swim across oceans to taste! Look forward to the next meal there! 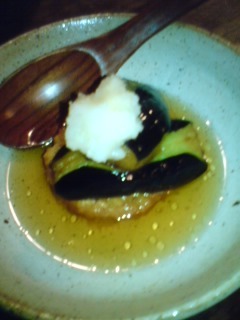 Waga is your typical new wave izakaya. Opened a little more than two years ago by the very young at hearｔ (a fan of the Beatles,Queen and Led Zeppelin among others) Shuhei Ichikawa it seems very popular as I managed to enter it only at the third try and this somewhat late at night. 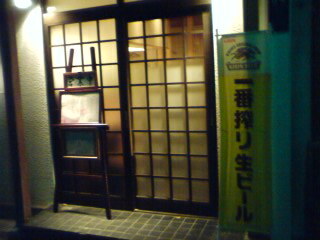 In any case if you plan to patronize the place before 9:00 p.m., you had better resrve in advance! 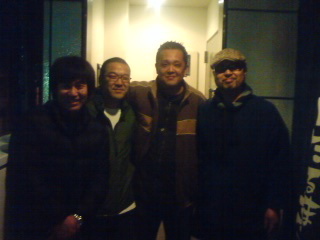 The staff in their late 20’s (30’s?) are a smiling hard-working bunch, but nonetheless extremely welcoming and attentive. 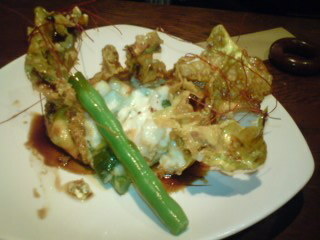 Now as any good izakaya, Waga always has at least a couple of remarkable jizake on offer, although they do change regularly. 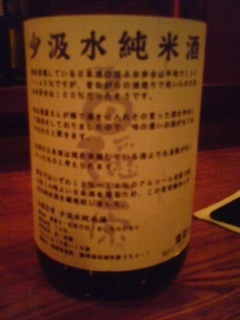 The first I ordered was a Hakuin Masamune Junmai by Takashima Brewery in Namazu, a real beauty! It just drank like wine! 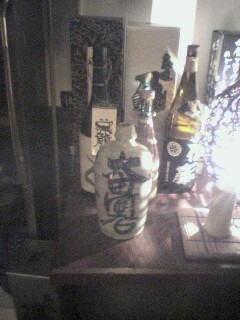 Pity I could not stay too long this time, or I might have contributed to the bottle death! Actually you had better keep your eyes wide open! 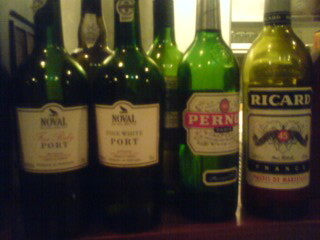 Not many izakaya offer French Pernod and Ricard, and Portuguese Porto wines! 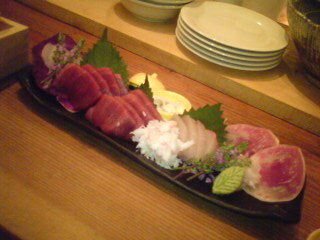 Now the first indication of a good izakaya, and especially in Shizuoka Prefeture, is its sashimi offering. 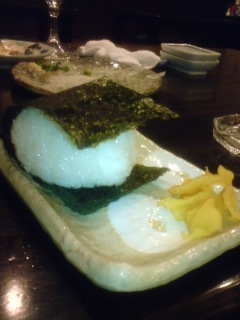 If you ask for “moriawase/plate”, you will get a good idea of the establishment. 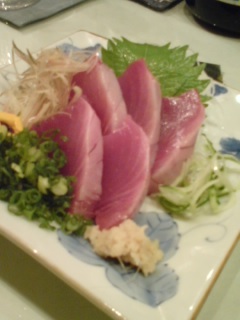 Now, the “Katsuo Tataki/Bonito slightly cooked”, “Kanpachi/Yellowtail” and “Maguro/Tuna” were simply of the higher level that would put a few vaunted Tokyo places at shame, but at very kind prices! 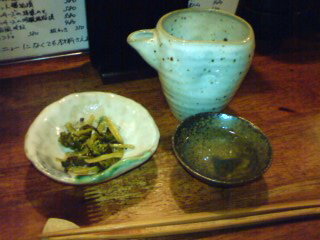 As I said, my friend and I were in a bit of a hurry, but we opted for dishes representative of the establishment. 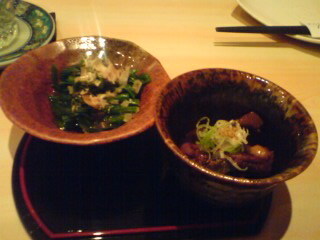 The seasonal dish was “Jukusei Tsurushi Buta Saute to Kisetsu no Kinoko Ankake/Sauteed matured Pork (with tofu) and seasonal mushrooms in sweet and sour sauce”. 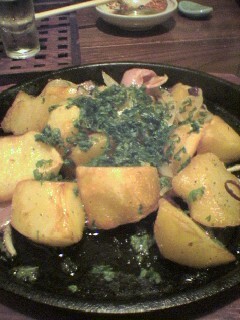 A hearty dish which should satisfy a big appetite! 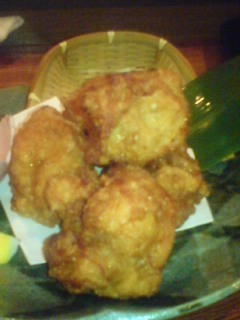 Talking of solid appetites the “Karaage/Deep-fried Chicken)” was not only succulent but absolutely enormous. You would problems closing your hand around any of them! 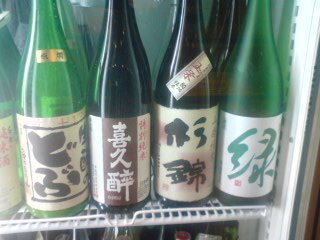 When it comes to sake I’m a big drinker. 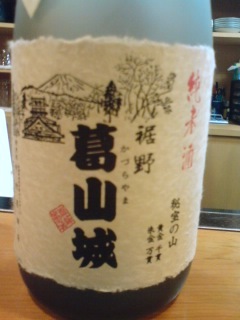 I asked for the other Shizuoka Sake available, Takasago karakuchi Junmai by Fuji Takasago Brewery in Fujinomiya City. 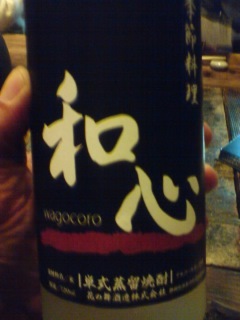 Very dry indeed, but so easy and pleasant to drink! 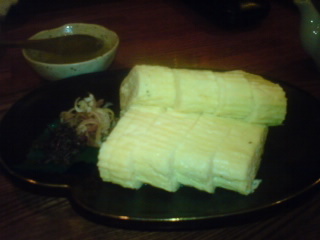 “Tamagoyaki/Japanese Omelette” is also another preriquisite at any good izakaya, and the one concocted by Waga is also a beauty. We certainly did not need any dessert! Blimey! 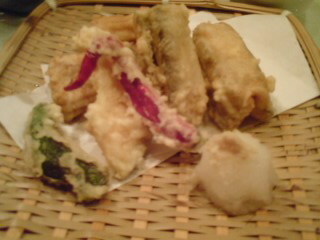 There is no way we could sample all the offerings. Which means I will have to come back in a hurry! 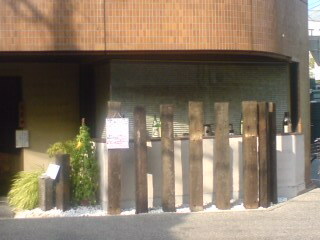 Opening hours: 17:30~23:30 (Monday to Thursday), 17:30~26:00 (Friday, Saturday and day before any National Holiday). Set menus and parties possible. 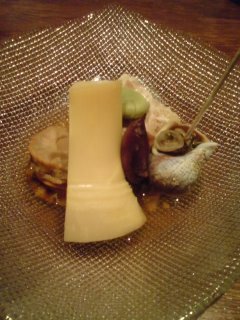 Toshiharu Matsuura’s establishement has always been a gastronomic experience to look forward to since September 1997 as his cuisine almost exclusively makes use of seasonal produce. 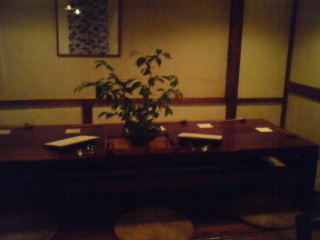 What makes the experience even more pleasurable is that you suddenly find yourself inside such a traditional Japanese setting with wood everywhere, be it at the counter, at a large table (very practical for long-legged expats!) 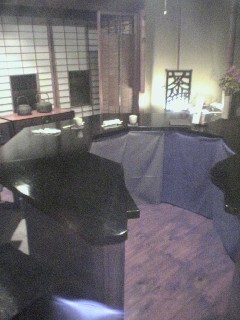 or on the tatami (usually I don’t mention it, but the toilets are a little beauty!) 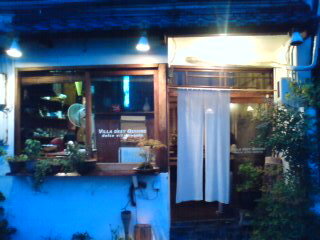 and where all the food is served in Japanese pottery (The owner has many friends among artists!) 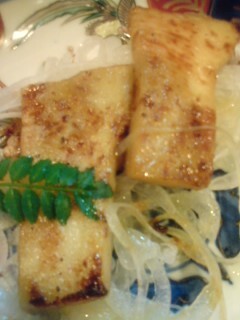 with wooden utensils. 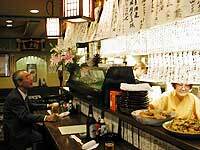 The menu changes practically every day, depending on produce avaibility in the local markets (I know where Mr. Matsuura buys his vegetables, fish and meat, and I can tell you you will not find anything fresher!). 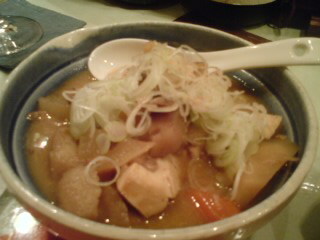 to fairly complicated such as ” Cold Shunsai Chyawanmushi”. 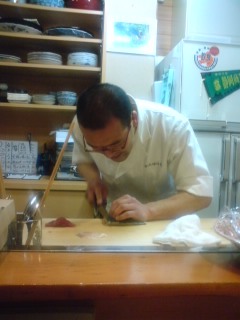 Although the oyakata works by himself and is very busy, he will always oblige and explain his cuisine. 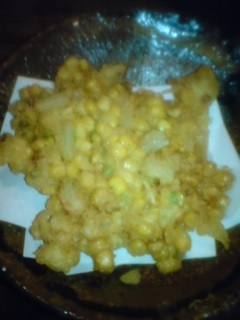 This is a very rare place where both omnivores and vegetarians can enjoy food together! 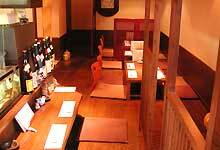 As for the drinks he will please anyone with his excellent assortment of sake, shochu and wines. 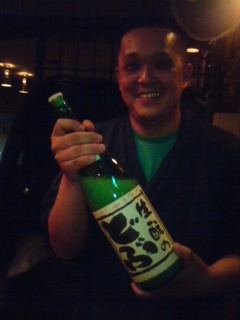 Moreover he makes a point of serving Shizuoka Jizake such as the brews from Morimoto/Sayogoromo Brewery (Kikugawa City) and Takshima/Hakuinmasamune Brewery (Numazu City)! And do not forget he also has some organic drinks in store! Especially recommended for ladies, couples and loners alike. 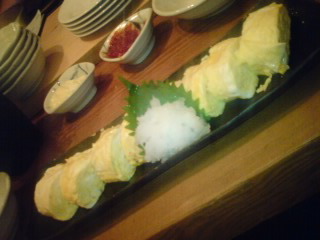 Mr. Sakurai had ordered a set menu (probably the most expensive one, judging from the quality and quantity!). 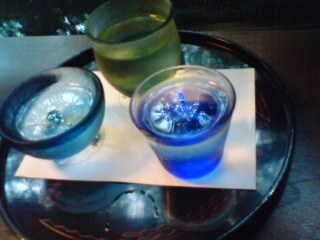 We had only the drinks to worry about! 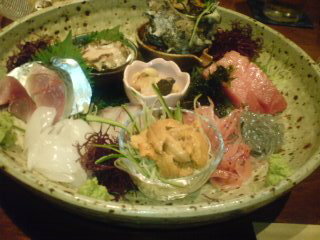 Like any worthy Izakaya in Shizuoka, Shibata features a good number of Shizuoka Jizake on its menu: Isojiman (Yaizu City), Kokkou (Fukuroi City), Shidaizumi (Fujieda City), Suginishiki (Sugii Brewery/Fujieda City), Kikuyoi (Aoshima Brewery/Fujieda City), Shosetsu (Kansawagawa Brewery,Yui Cho), Kaiun (Doi Brewery/Kakegawa City)! Before I go through all the morsels I’d better hoot for Rowena, Gaijin Tonic, Foodhoe and Simaldeff to prepare themselves (and call their friends, LOL)! 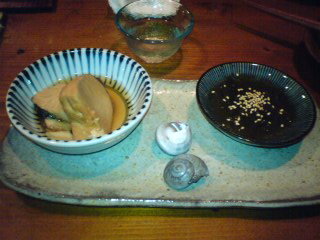 The “snack” coming with first drinks was a proof of the quality of the establishment: boiled bamboo shoot, grilled clam, shellfish in its shell and broad beans. 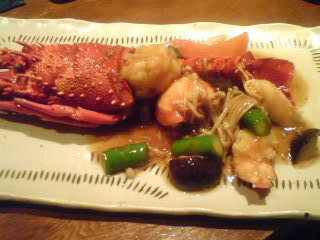 Ise Ebi to Kani Gusoku Ni/Spiny Lobster and crab legs in Japanese-style sweetand sour sauce. 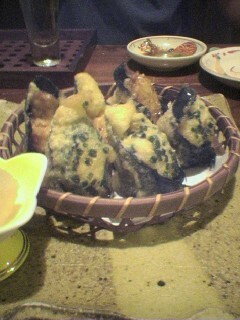 The lobster is Australian and the crab Russian, but very tasty! 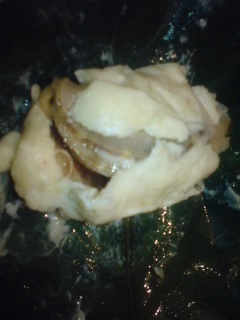 Ooba no Tsutsumi mushi/Clam steamed inside a bamboo leaf. 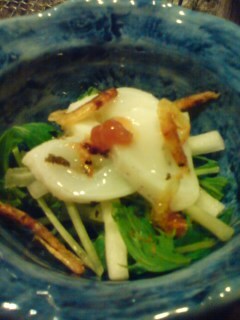 reminiscent of Vietnamese food. Both deicate and fulfilling! 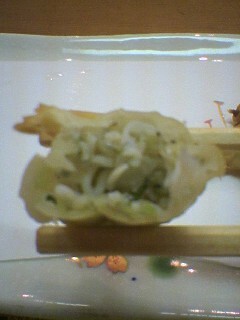 Fish and shellfish in white sauce baked inside yuba/”toofu skin”. 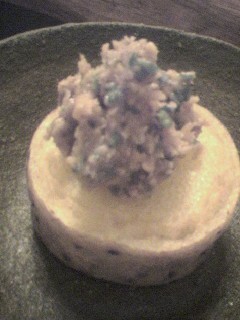 A dish that would be appreciated anywhere as you could easily make a vegetarian version! A shame you have to open it! 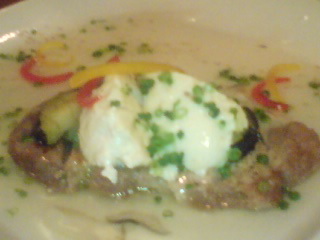 The last dish before the dessert (sorry I got carried away and forgot to take a pic of the latter!) 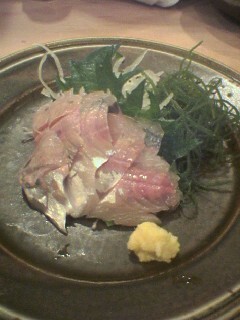 was a typical Japanese fare: Sawara no kidomeyaki/Large Mackerel variety grilled topped with garnish made with Japanese herbs and spices. 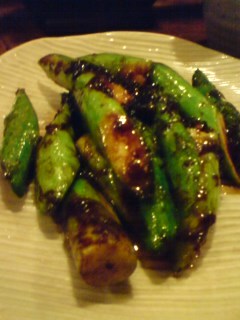 and Nasu no Denraku/Egg-plant or Auubergine grilled topped with a sweet miso sauce. Holy Macaroni! Getting up proved an almost exhausting excersise! Shizuoka City can be a dangerous place at times. 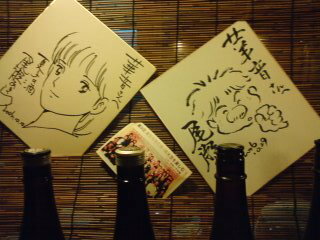 That is, if you accept an invitation to dining and drinking by a notorious band of Shizuoka Izakaya owners and their staff! 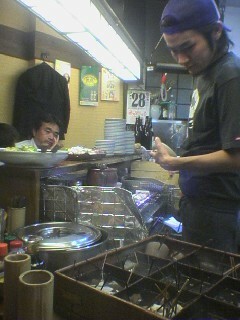 Mr. Tozaki and his assistant Mr. Sugiyama of Hanaoto Izakaya and Mr. Mori Katayurimo Izakaya. Kodarumatei moved to its new location last Autumn and is a very busy place. 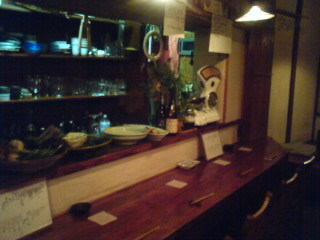 Needing to reserve a table on a Monday night is certainly a proof of the establishment’s popularity! I decided to take a back seat as far as ordering was concerned. After all those guys know their stuff! 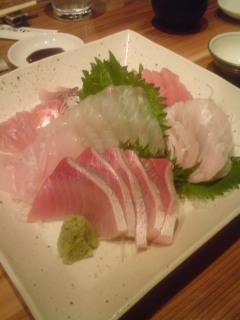 Sashimi was quickly agreed upon and we were brought this grand plate that would attract Chuckeats‘ attention! 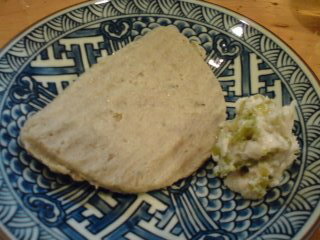 simple, tasty and sublime! Shizuoka Prefecture is blessed with one of the richest sea in Japan, and all of the fish were caught the day before off our coast! 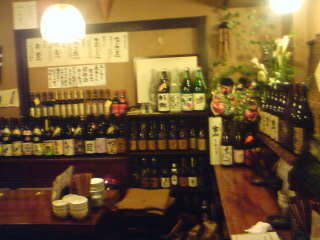 Kodarumatei is renown for its selection of sake, including some great brews from Shizuoka Prefecture: Kikuyoi, Suginishiki, Kaiun, and others depending on arrivals. one more reason to patronize this establishment! 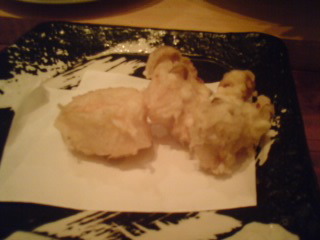 Now here is food that would have Foodhoe and Gaijin Tonic coming running! 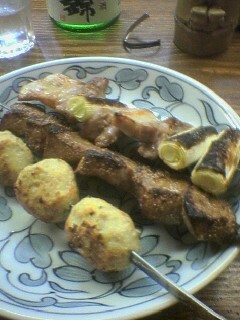 Apparently deep-fried minced chicken balls and pork brochettes are a must in this establishment and I totally agree! 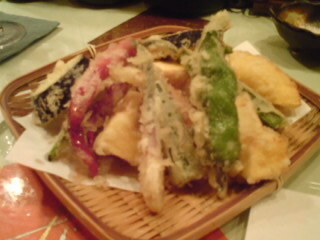 Vegetables are certainly not forgotten as demonstrated by some great tempura and salads that would please any vegetarians! 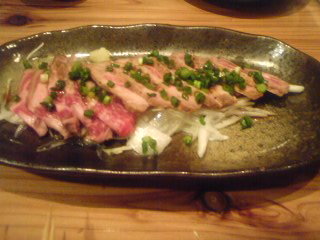 But my pick of the day was the grilled whalemeat steak presented cut on a simple dish. Simply crumptious! 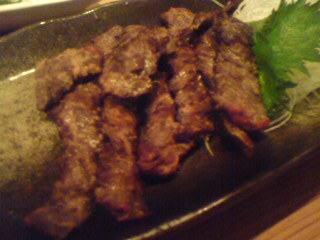 We could not resist our carnivorous instincts and oredered an extra dish of sauteed beef. As I was limited timewise on that first encounter, we agreed to call it a day (actually my new friends went “next door” after sending me off! I told you Shizuoka City could be a dangerous place, didn’t I? 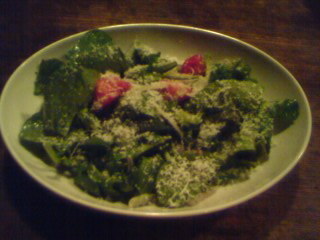 ), But I can assure this newfound friendhip will lead to some memorable outings in the future! 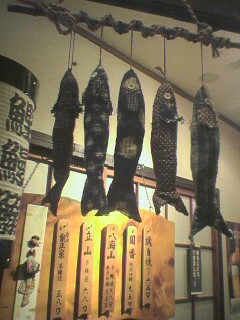 Kashimaya has long been an institution In Shizuoka City where its 78-year existence makes it one of the oldesｔ izakaya in town. It certainly deserves its enormous popularity as it strikes the ideal combination of good food, good drinks and good prices. And smiling service! 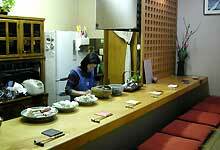 It has kept its traditional atmosphere with tatami, wooden counters and decorations. 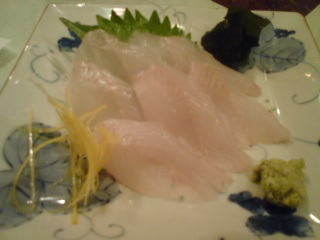 Their sashimi is top-class (isaki/grouper and katsuo/bonito in above pics) and usually comes from Shizuoka waters. 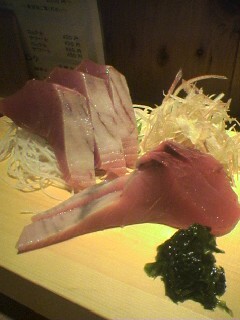 But you had better come early as sashimi is the first item they tend to run out of quickly! 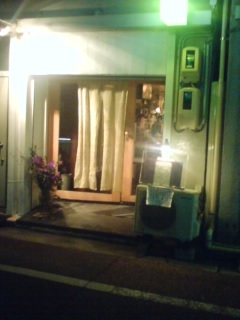 The kind of place where you easily become a regular as their menu do follow the seasons! 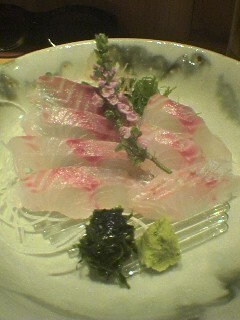 Tonami originally opened in 2002 but was bought by the present couple owners mid 2005, for the better, I must say. 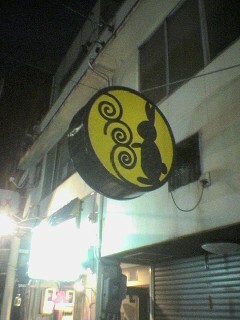 The name “Tonami” means “Rabbit Wave”, and for rabbit lovers, the place is simply full of them! Located in the middle of the Shizuoka “Gourmet Town” Tokiwa-cho district, it is a very welcoming place where individuals or small parties of up to four will comfortably sit. I noticed that customers greatly vary in age, always a good sign. 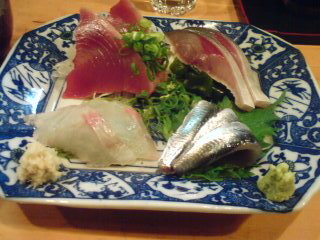 As in any such establishments, sashimi is a good criterion for judging the quality of the fare: the sanma (saury, mackerel pike) was excellent and very fresh (they serve us the bones and head deep-fried later) and very tasty. 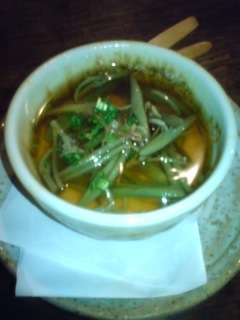 They also serve a mean Japanese-style tripes curry! All at reasonable prices for such an establishment. 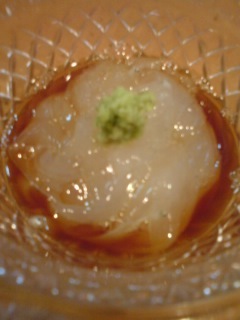 As for drinks, the usual, but they also serve an excellent Shizuoka Sake, namely Isojiman Honjozo (Yaizu City): no need for dessert! A place certainly worth a second visit! 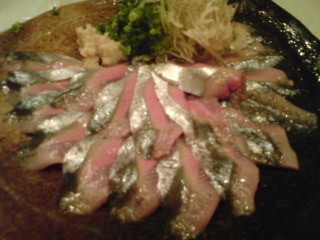 Umaizura (actually mean Horse Face! 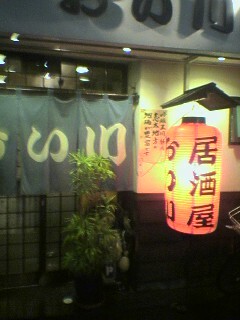 The kanji for horse is featured in the address, Mr. Konagai forename and izakaya’s name!) 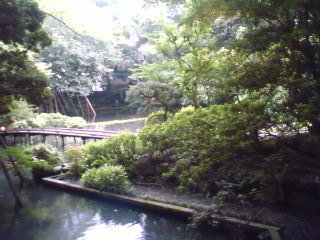 is one of those “kakureya” (hidden spot) that would be impossible to discover without a guide. 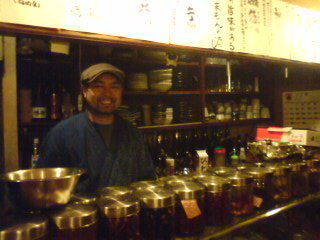 I was lucky enough to be introduced to this very traditional izakaya by my ne “sake friend”, Mr. Koyama who is in the preocess of writing a homepage for the Shizuoka Sake Brewers Association. 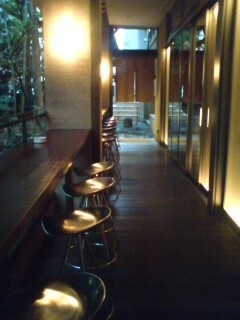 The entrance, once discovered in a dark side street opens onto a very comfy interior replete with traditional and antique Japanese furniture. 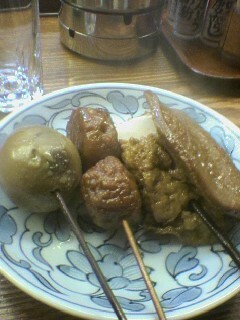 You have a choice of sitting between a counter where you can have a look at the Shizuoka-style oden (I had to forego them this time! 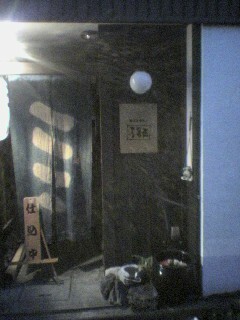 ), rooms and corners all with tatami, some with dug space for your legs (expats better request for those), others with cushions on the tatami floor. This is not an extensively list as it changes regularly. Mr. Konagai will be only too happy to tell you what he has in stock and describe the brands he has on hand. 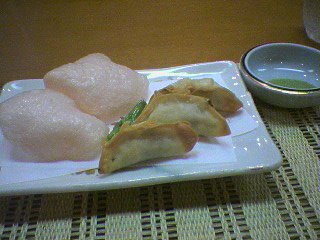 Now, as I shall have to visit it again for the oden and more sake, expect another article very soon! 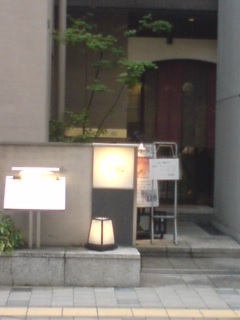 If you happen to be staying, let’s say for a single night in Hamamatsu City, near the JR Station, I would suggest you visit Takasagotei Restaurant on the second floor of Hamamatsu Sago Terminal Hotel just right of the JR station south exit. As a hotel izakaya since the 1970’s they are definitely above the run of the mill level of the fare usually delivered in business hotels. 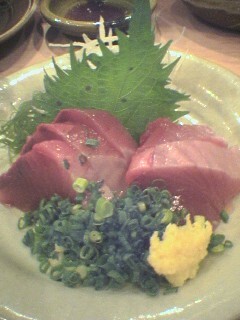 Their sashimi offerings are within the good level prevalent throughout the Prefecture. 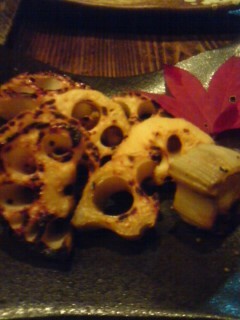 I found their mushroom tenpura (vegetarians, please note!) excellent. 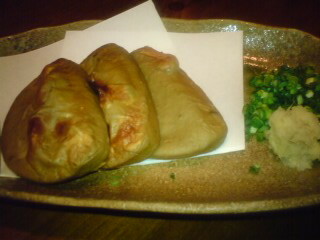 They also had an unusual “shirasu gyoza” (deep-fried whitebait dumpling), which would go well with a beer. Wagocoro is your typical Japanese “Kakureya”/”Hidden Place”: You have heard of it, but never been able to discover or notice it until you find it one day almost next door! The Japanese, especially in Shizuoka, have an affinity for such places, but tend to jealously protect them away from other potential customers, which in my humble opinion is not very fair. 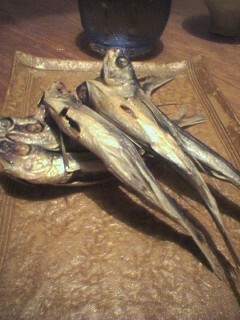 I almost feel a malign pleasure in discovering and uncovering them! 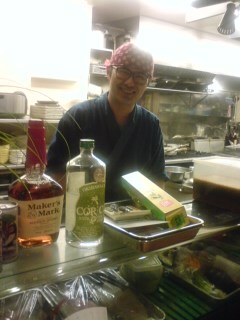 The present owners acquired the place some time ago from the original tenant who had made it a shochu bar. The place is simply replete with Japanese antiques and interestingly enough Mr. Oguriyama and his son have faithfully preserved it in its entirety. 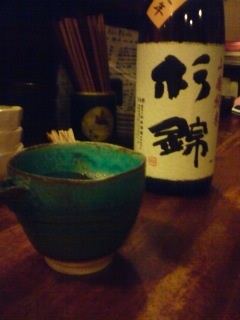 Notwithsatanding the great food and drinks, the ancient Japanese atmosphere is a worthy enough reason for a visit. 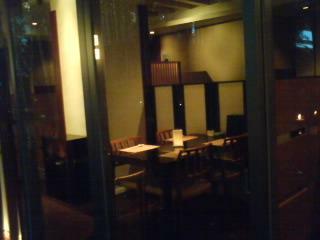 Now this izakaya have three “rooms”, the main one where you can sit around a tradiionla Japanese “irori/fireplace” where you can grill your own food over charcoal. 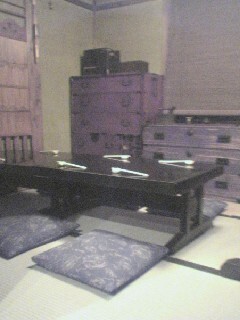 Another room with tatami seating amide a crowd of antique furniture and objects and a third room with a kind of counter and high seats. 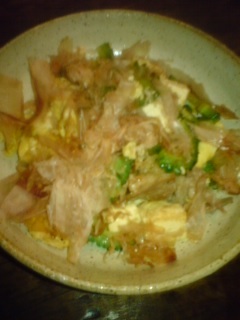 No need to say but the irori is my favourite. Make sure to reserve it! 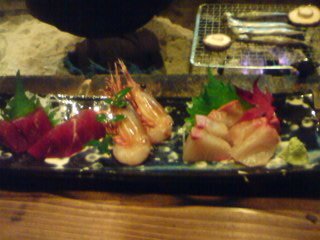 You have a hint of the quality of the food as soon as you order your drinks and subsequently are offered the “otoshi,snack”! 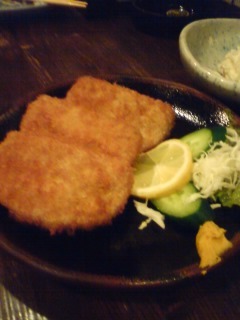 Now, Wagocoro has already acquired a solid reputation for quality of food coupled with comparatively reasonable prices. 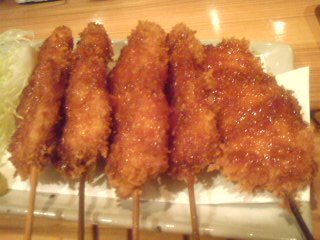 Therefore when I visited it on Monday, December 3rd in the company of my monthly “Monday Gastronomy” companions,we already had a good idea of what we would order! 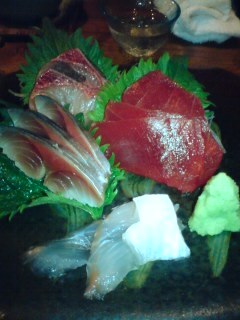 The sashimi and grilled fish (see pictures above) are simply first class. 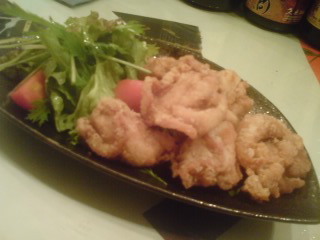 Their “kakuni/pork simmered for four hours” has already become the talk of the town and expats in particular will be happy to learn they concoct savoury deep-fried oysters and even vegetarians will be glad to sample the deep-fried lotus roots/”renkon”! We simply did not have any strength left to explore the rest of the seasonal menu which will have to wait until our next visit! 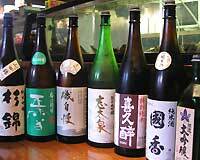 Like any good izakaya, Wagocoro has a great range of local sake: Kaiun (Doi Brewery/Kakegawa City), Wakatake (Oomuraya Brewery/Shimada City), Suginishiki (Sugii Brewery/Fujieda City), Isojiman Brewery (Yaizu City), Hakuin masamune (Takashima Brewery/Numazu City) and Kikuyoi (Aoshima Brewery/Fujieda). 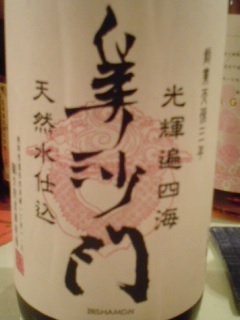 The four of us emptied a great bottle of Suginishiki Shiboritate Yamahai Honjozo in no time! Now the big plus is that they also serve two Shizuoka shochu, namely wasabi Shochu by Bandai Brewery in Shuzenji and rice shochu by Hanan no mai Brewery in Hamamatsu City which went as far as designing an original label! 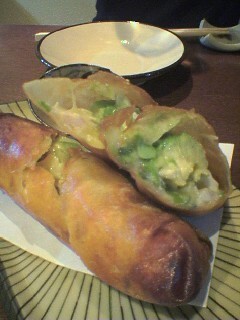 Izakayas have been “sprouting” all over Takajo Machi in Shizuoka City, an area recently referred to as the “Shizuoka Daikanyama”. My better (worse?) 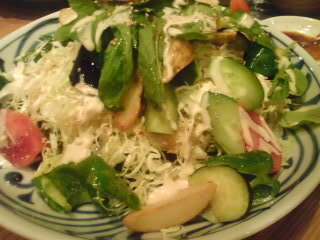 half and I found this little place called Hayase　along a fairly large street and decided to give a try. 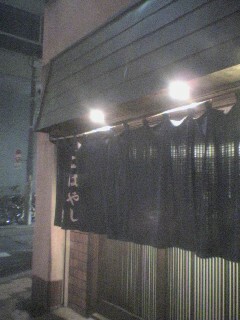 An unprepossing, almost discreet, izakaya, it was open in February this year. Apｐarently it is already quite popular and were lucky to enter it around 19:00 as it got full within half an hour. 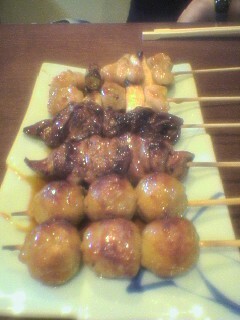 The inside is extremely clean for an izakaya specialized in “yakitori”. 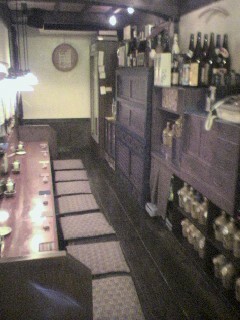 It sits about 8 people at the counter, 6 more at tables and chairs and a dozen on tatami floor. 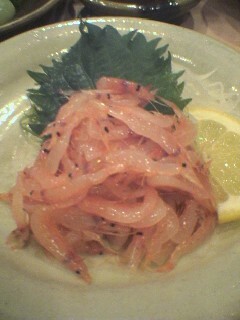 We found ourselves in a little dilemna as Hayase also proposed some sashimi we just could not resist. 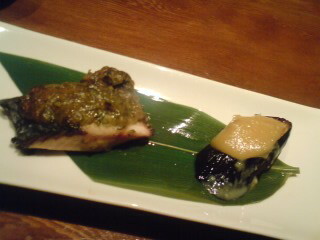 The bonito was absolutely excellent. 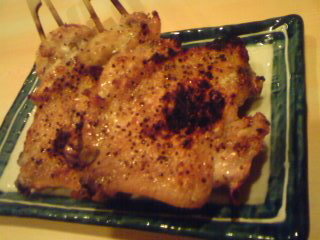 After that we started ordering yakitori in earnest, and I just did not have enough time to take all the pictures I wished to. Which will give me a good excuse to come back, especially considering the reasonable prices for such a place which could become quickly expensive at other establishments. Look forward to my next visit report! 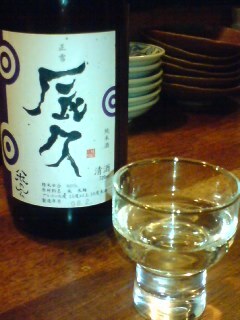 Talking of drinks, Yasaitei is truly a Shizuoka establishment when you realize that apart of 2 Shizuoka shochu, they serve 4 Shizuoka jizake! 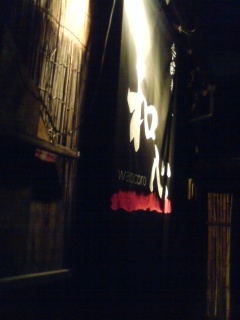 Tanuki No Hana (“The Racoon’s Lair”) is a must if you wish to tell later that you have tasted Shizuoka Prefecture’s best sake wherever you might want to boast about it! Bu-Ichi has long been a special favourite of mine and has never disappointed over the years thanks to the shy chef’s constant attention to details and knck for discovering the right staff. 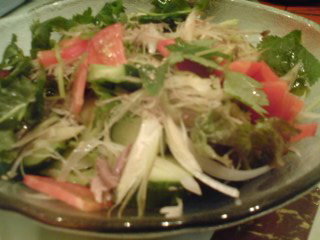 From starters to main it is a succession of solid good qulaity izakaya fare. 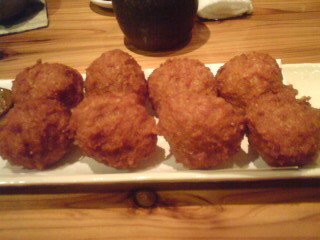 The menu will take quite a few visits to exhaust. 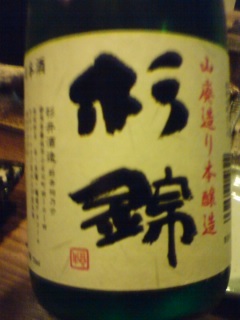 Sayogoromo Honjozo (Morimoto Brewery), Kokkou Tokubetsu Junmai, Kikuyoi Junmai, Fujinishiki Daiginjo (who got the highest accolade for Daiginjo in 2007! 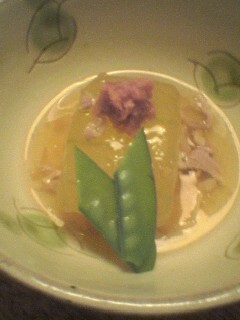 ), Hatsukame Junmai and Isojiman Honjozo! 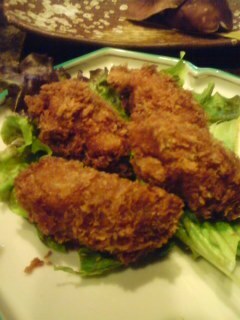 I had meant for a long time to introduce one of, and probably, the oldest traditional izakaya in Shizuoka City, namely, Takano. Conveniently situated near the JR Station, it was founded in 1923 and is presently looked after by the fourth generation in the person of Susumu Takano (36) who has the advantage of speaking fluent English. His parents and relatives are still near to give a hand, and he certainly needs all their help as the place usually is packed by 5 p.m.! I could not postpone the visit any longer when my good friends Neil and Mark agreed to all meet there last night (May 18th) in the company of a lady friend, Miki, and Mark’s better half later. I made sure to take their picture before we became hopelessly overwhelmed by our drinking as usually happens in the company of those two Englishmen, especially when I can drag them from the beer into sake! 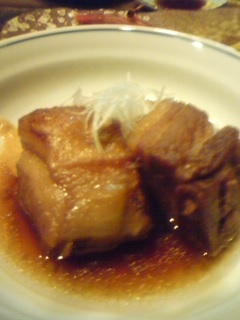 Food at Takano is plentiful, very reasonable and of good quality. 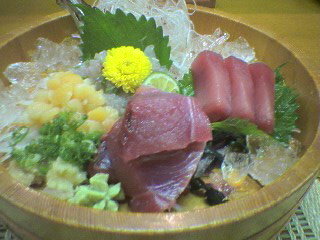 Always ask for the sashimi assortment if you want to know what we people in Shizuoka eat. 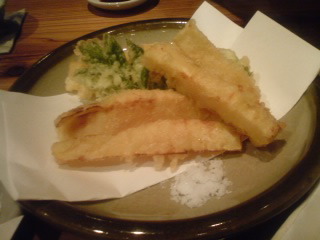 And do not miss the specialty of Shizuoka, Sakura Ebi as Tempura　or Kakiage. You will never tire of it! We asked for three more bottles of the last one! 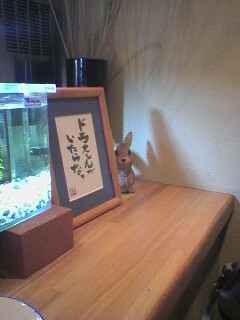 By that time, I was getting a bit fuzzy and decided to postpone further experiences to future articles!